General Carney is the son of Robert Bostwick Carney, Admiral, United States Navy, who is buried adjacenet to the Genera in Section 2 of Arlington National Cemetery. We are actively seeking information regarding the General. Should you have such information please contact the Webmaster. 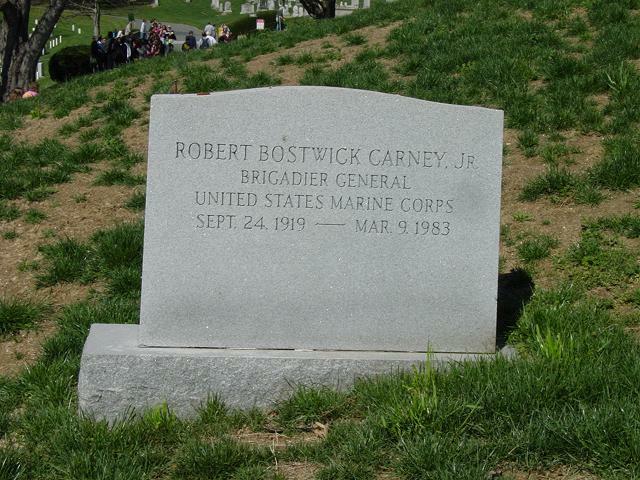 Retired Brigadier General Robert Bostwick Carney, Jr., 63, former commander of Marine Barracks in Washington, D. C. from 1964-1968, died at his home in Arlington, Virginia. General Carney earned the Bronze Star Medal with Combat "V" for his service with the 5th Marine Division on Iwo Jima and was awarded the Legion of Merit with Combat "V" for his service in Vietnam. He retired from active duty in July 1972.